I like diversity, diversity in appearance, culture, skin color and the likes. I am drawn to people who are different, people who do not fit into the "normal" status quo. I'm also learning I like people who think differently than me. people who think outside the "box" and even people who disagree with me. They shake up and challenge my neat and tidy little world. Our normal tendency is to drive life hard and fast with people who look just like us, people who are going in the same direction as us and people who are driving just as fast as us. But God! He puts speed bumps in our way. 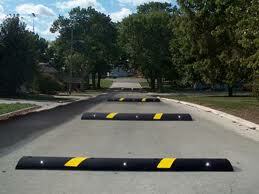 How do you react when you come upon a speed bump? Do you feel the anger, the resistance? When resistant from your heart raises its head, know it is a place to begin digging. When your faith is challenged use the anger you feel to dig deep into God's word. It is essential you know and understand what you believe and the reason why. Otherwise you will be carried about with every wind of doctrine. Eph. 4:14 I have been told many Mormons were originally Southern Baptist. I'm not sure if this true but I do understand how a person not grounded in their faith can be swept away into false belief. I think having our beliefs neatly packaged and handed to us has caused shallow roots that are easily blown over. If you want the gold nugget, you must dig. Gold does not float to the top, it settles on the bottom. To know the truth of God's word, you must dig and you must struggle-grapple with the Word. Apply it to life, fall down, get up and grapple again. Truths grappled with are not easily blown over. There is security in sameness. I get it...My house has looked the same for 5 years and if we still live here, it will look the same in 10. I have worked the same job for almost 10 years. Unless I'm fired, I plan on continuing on day after day. Security! There is security in routine...yes I get it. But I also know God is NOT routine at least as we understand routine. God is unchangeable. He is the same yesterday, today, and tomorrow. We must to get to know Him. We must understand what we believe. We must find our security in Him as we study, as we learn, as we grapple with His truths. Jesus is the TRUTH. Don't resist the speed bumps!